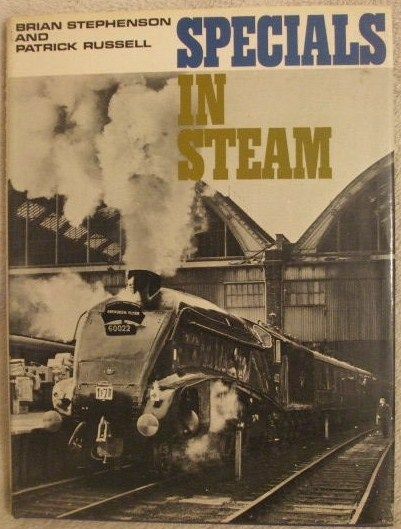 First edition, Second impression hardback of SPECIALS IN STEAM, by Brian T Stephenson and Patrick Russell and published by Ian Allan Ltd., London in 1969. It was first published in 1968. The book is in very good condition (Clean blue cloth boards with white lettering on spine), with only slight wear to the pictorial dust jacket which is price clipped (very slight creasing to the edges, minor bumping to the corners, light moisture stain inside the jacket which is not visible from outside). Internally, the pages are clean and tight and there are no tears and no inscriptions. "Rail touring by enthusiasts began as long ago as 1938 with a special train run by the Railway Correspondence & Travel Society from Kings Cross to Peterborough hauled by a restored Stirling Single, but it is during the last 15 years (1960s) that the vogue for enthusiasts specials has reached its peak. Since 1938 well over 500 specials in steam have been run and every one of them must have been photographed hundreds of times. Presented here is a short representative selection of the photographs the authors like best. In just over 200 pictures it is impossible to show every special train and the book is not therefore a comprehensive illustrated history of rail tours, but as many locomotive types as possible have been illustrated. Although not arranged chronologically, some order is necessary and the theme of the book takes the form of the geographical tour of the British Isles." Unpaginated (128 pages). Illustrated with black & white photographs throughout.